An array of colorful vegetables in the diet improves nutritional intake, aiding our strive for optimal health and reducing the risks of chronic disease. U.S. dietary guidelines encourage eating 4 1/2 cups of a variety of fruits and vegetables daily, however, there are no recommendations for white vegetables such as cauliflower, turnips, onions, parsnips, garlic, potatoes and mushrooms. Color can be an indicator of phytochemical content, particularly polyphenols, that provide antioxidants and other health benefits. The well known colorful phytochemicals include carotenoids, chlorophylls and anthocyanins. However, there are types of flavonoids that are colorless and no less important for health. The average American consumes less than 2 cups of vegetables and fruits per day, half the recommended amount. 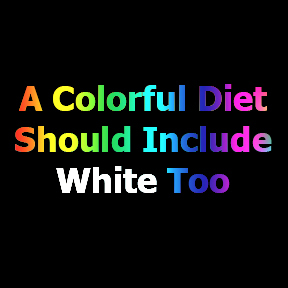 The inclusion of white vegetables can notably increase fiber, potassium, calcium, and magnesium intake and may increase overall vegetable consumption among all age groups in the U.S. Although consumption of starchy vegetables such as potatoes has decreased, potatoes are a culturally familiar, popular, and inexpensive food that contain high quality, easily digestible protein along with vitamin C, potassium and soluble fiber. Potatoes – Potatoes are one of the highest sources of dietary potassium, which is essential for healthy blood pressure. Approximately 3% of American adults get their recommended daily dose of this vital mineral, which shows signs of protecting bone health and reducing the risk of cardiovascular disease and stroke. A baked potato with skin will provide half the daily dose of vitamin C, B vitamins, potassium, and resistant starch, which takes longer to digest, benefiting colon health and blood sugar and keeping your hunger satisfied longer. Onions – Onions contain calcium, vitamins C and E, folic acid, antioxidants and fiber. Onions help protect gut health by providing defense against harmful microbes. Onions also contain quercetin, which has beneficial effects against cardiovascular disease, cataracts and some cancers. Celery Root – This root vegetable, also known as celeriac, has a potato like texture and is packed with fiber, potassium, magnesium and vitamin B6. It also contains more than 70% of the recommended daily intake of vitamin K, which has been linked to healthy bone density. Garlic – Garlic has been used extensively throughout ancient and modern history both as flavoring and as a treatment for a wide range of conditions and diseases. Garlic is well known for its antibacterial, antiviral and anticancer properties. Garlic helps to prevent plaque buildup on artery walls, helps to prevent unhealthy blood clotting, and improves circulation, reducing the risk of cardiovascular disease and stroke. Cauliflower – Cauliflower is packed with fiber and cancer fighting phytochemicals. Cauliflower has anti-inflammatory and antibacterial properties, and is an excellent source of vitamin C, vitamin B complex, and vitamin K. Cauliflower also contains the minerals manganese, copper, iron and potassium. Parsnips – Parsnips contain a wide variety of antioxidants, vitamins, minerals and nutrients including soluble and insoluble fiber, folate, potassium and vitamins C, E, and K. It also contains healthy levels of minerals such as iron, calcium, copper, potassium, manganese and phosphorus. The antioxidant compounds in parsnips have anti-inflammatory, antifungal and cancer fighting properties. Cabbage – Cabbage is one of the most nutritious foods and is packed with vitamins A, B, C, and K and calcium, magnesium, potassium, iron and is a great fiber source. Cabbage contains strong antioxidants, anti-inflammatories and antimicrobials. Ginger – For thousands of years, ginger has been used for its therapeutic and preventative effects. Ginger’s health benefits include anti-inflammatory, analgesic, antioxidant and anti-vomiting properties. Ginger contains a very high level of antioxidants, which are a powerful weapon against many types of cancers. Mushrooms – Mushrooms are a good source of chitin and beta-glucan, both of which are fibers that lower cholesterol, improve cardiovascular health, and boost the immune system. Mushrooms contain energy providing B vitamins and are a natural source of vitamin D. Mushrooms also contain copper, which helps make red blood cells and germanium, which helps the body use oxygen more efficiently. Mushrooms are also good sources of selenium, niacin, potassium, iron and phosphorus. White Grapes – Grapes are rich sources of vitamins A, C, B6 and folate in addition to essential minerals like potassium, calcium, iron, phosphorus, magnesium and selenium. Nutrients in grapes support eye and bone health, the cardiovascular system, relieve indigestion and have strong antiviral and antibacterial properties. Bananas – Bananas contains fructooligosaccharides, which act as a prebiotic in promoting healthy gut bacteria, and short chain fatty acids which protect the intestinal tract. Bananas are rich in the soluble fiber pectin, which assists healthy digestion and elimination. In addition to potassium and magnesium, bananas contain tryptophan which, when converted to serotonin, helps to regulate mood. Mycotaki by Metagenics – Mycotaki is a powerful formula that features a concentrated water extract of 7 nourishing mushrooms with an extensive history of use in enhancing human health. Ginger Herb Complex by Progressive Labs – This complex contains a combination of ginger and herbs that support stomach comfort, digestion, and the intestinal tract. Super Garlic 6000 by Metagenics – Each tablet of this super-concentrated garlic supplement is guaranteed to supply 6,000 mcg’s of allicin, garlic’s most important active ingredient. This entry was posted in Home and tagged white food. Bookmark the permalink.